Measurement of economic performance of a country based on a single indicator is considered narrow, which may not depict the real picture of an economy. Certainly, single indicator separately provides some useful information, but that might mislead the desired policy target and develop wrong perceptions about the overall performance of the economy. Thus, a comprehensive multi-dimensional index, consisting of several important indicators, is essential to provide proper signals about the progress or deterioration of the country. This composite index is called macroeconomic performance (MEP) index, which combines several indicators into one single succinct statistic. One simple but vital question about this index is: how will the information embedded in the MEP index benefit the overall economy? The MEP composite index might be used by the foreign investors, rating agencies, private investors, and policymakers for their planning and decision-making process. The objective of the paper is to construct a robust macroeconomic performance index of India using data envelopment analysis (DEA) over 1980-81 to 2015-16, and then, test the utility of this index to verify whether it genuinely captures the economic performance of India. We use six major macro indicators, namely economic growth, employment rate, terms of trade, inflation rate, fiscal deficit, and pollution to compute the MEP index. Data on all variables are obtained from the Hand Book of Statistics on Indian Economy of Reserve Bank of India, and World Development Indicators of the World Bank. We have constructed two separate indices, i.e., MEP and Eco-MEP index. The MEP index is constructed by using five indicators, i.e., economic growth, employment, trade, inflation, and fiscal deficit, while the Eco-MEP is done using all the selected six indicators. The very purpose of constructing the Eco-MEP index is to examine whether the objective of reducing environmental pollution has any noticeable impact on the MEP of Indian economy. Most of the earlier empirical studies have investigated the MEP in advanced and emerging countries by using cross-country data rather than country-specific data. In India, previous studies have focused only on measuring fiscal performance or macroeconomic performance at the State level (Sahoo and Acharya, 2012; Dholakia, 2005). To the best of our knowledge, our present study is the first attempt to develop such a comprehensive composite index in assessing the MEP of India over the last 35 years, using DEA. It is, arguably, the first to incorporate fiscal deficit and pollu-tion as additional indicators for the construction of MEP index of India. Along with MEP, it constructs Eco-MEP index of India for the first time. 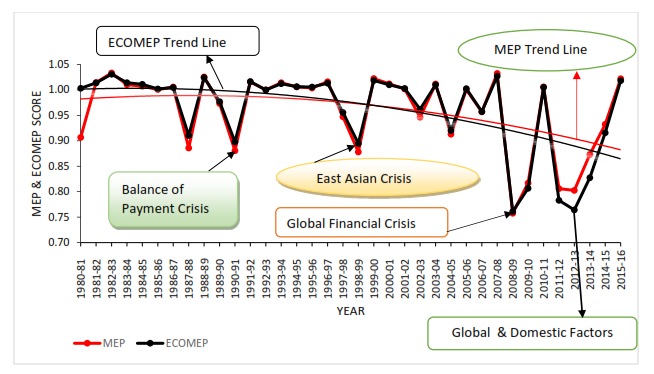 Figure 1 exhibits the constructed MEP and Eco-MEP indices over the study period of Indian economy. These indices capture the major events that has been affecting the economy severely during the study periods, i.e., the balance of payment (BOP) crisis in 1990-91, the East Asian crisis in 1998-99, the global financial crisis in 2008-09, the global factors especially the turmoil in the euro-zone countries along with the domestic factors like tightening of monetary policy owing to high and persistent headline inflation, slowing investment and industrial activity etc. in 2011-12. So, these indices may be considered realistic as they precisely reflect the economic activity. It shows that the year 1982-83 was the best performing year, and the year 2008-09 was the worst performing year for the country. Both indices have performed well consistently in the 1980s and 1990s, and Eco-MEP is found better over MEP. However, after the 2000s, there is relatively noticeable fall in the performance of Indian economy wherein Eco-MEP suffers the most. It indicates that pollution has a negative impact on the overall performance of the economy. Thus, while measuring macroeconomic performance for a country, the pollution indicator should be taken into consideration. The mere construction of performance index is worthless if it does not capture the real performance of the economy. To test the utility of these indices, we have linked these constructed MEP and Eco-MEP indices with the other major macro variables, i.e., private investment, current account deficit, foreign institutional investments and foreign direct investments of the Indian economy. Basically, to examine how these selected significant variables do behave with these index scores. The Autoregressive distributed lag (ARDL) bounds testing approaches to cointe-gration methods are used to test the robustness/utility of these indices. The results find that MEP and Eco-MEP have a positive impact on private investment, foreign investment inflows and foreign direct investment, and negative effect on current account deficit. Hence, the suggested multidimensional index is more stable, robust and genuinely captures the economic performance of the country. Dholakia, A. 2005. Measuring fiscal performance of states: an alternative approach, Economic and Political Weekly, 40: 3421-3428. Mohanty, R. K. and B. K. Sahoo. 2017. Examining the Eco-macroeconomic performance index of India: a data envelopment analysis approach, NIPFP Working Paper No. 202 (July). The One pager is based on this paper. Sahoo, B. K. and D. Acharya. 2012. Constructing macroeconomic performance index of Indian States using DEA, Journal of Economic Studies, 39: 63-83.